In January 2017, Governor Andrew Cuomo launched a new initiative to advance Health Across All Policies in New York State. Health Across All Policies is a collaborative approach that integrates health considerations into policymaking across all sectors to improve community health and wellness, recognizing that a community's greatest health challenges are complex and often linked with other societal issues that extend beyond healthcare and traditional public health activities. To successfully improve the health of all communities, health improvement strategies must target social determinants of health and other complex factors that are often the responsibility of non-health partners such as housing, transportation, education, environment, parks, and economic development. The Governor's announcement specifically called on the state's Public Health and Health Planning Council and its Ad Hoc Committee to Lead the Prevention Agenda, to lead this effort. As directed by the Governor, this initiative is initially focusing efforts on creating age-friendly communities and policies. Incorporating policies that promote healthy aging will help NYS agencies to consider the needs of all populations and environments in which people live as they develop and implement new programs. The long-term goal is to engage all New York State agencies in a collaborative approach to embed health improvement and healthy aging policies as a focus of decision-making within all agencies. 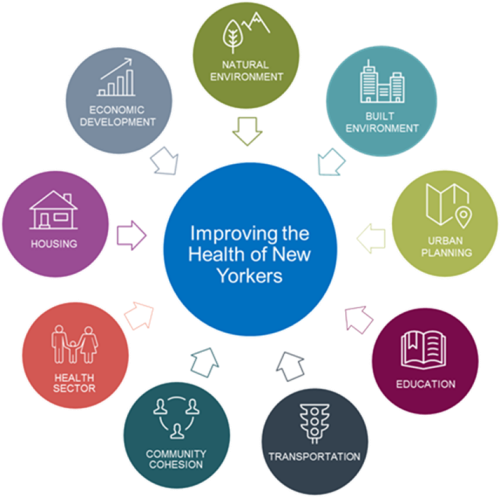 New York State recognizes that a community's greatest health challenges are complex and often linked with other societal issues that extend beyond healthcare and traditional public health activities. To help overcome these challenges Health Across All Policies (HAAP) was created to identify and strengthen the ways that all state agencies can have a positive impact on health. The eight domains represent areas of focus that have an influence on the health of a community and affect the quality of life for people of all ages. These domains help state agencies to identify and consider how their policies and programs can have a positive impact on community health. Please click on the domains to learn how each domain helps to improve the health of the community, and how NYS agencies are leading the way.